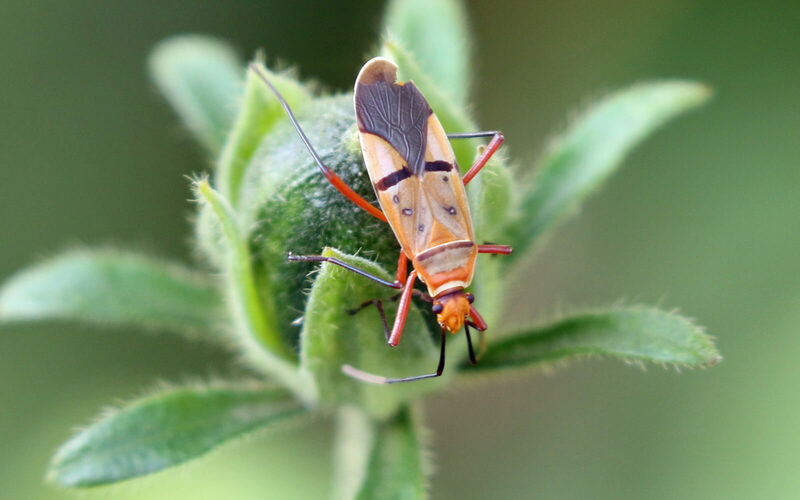 Insects are a hugely diverse and abundant group of invertebrates. They play important roles in the smooth functioning of many ecosystems. While some are perceived as pests because they compete with man for food, or carry diseases, the vast majority are beneficial. 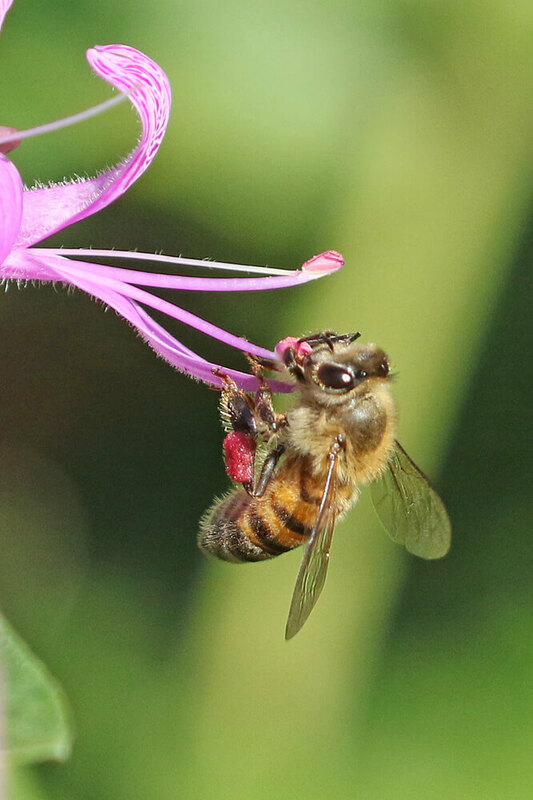 Amongst other things they serve as a significant food source for many species and play vital roles in pollination and decomposition. We are becoming increasingly disconnected from the natural world and run the risk of creating a rift with our very foundations. As an avid amateur wild life photographer I am always on the look out for anything that moves. On slow bird days I often find myself rummaging among the shrubbery where there is usually some action to be had. I was frustrated in my early attempts at macro photography by the difficulty in getting close to live subjects. I soon learnt that it was possible to capture large images yet remain suitably far from the subject by using a fast zoom lens with a close focus capability. The Canon EF100-400 mm 1:4.5-5.6 L Mark II serves this purpose well and allows close focus to a remarkable 98 cm. Combine this with a body that allows efficient auto-focussing and rapid shooting (in my case a Canon 7D Mark II) and you have a formidable tool for freezing insect action. The next steps are to wait for a sunny day, locate some insect action, get comfortable and fire away. Given that there is a need for deft movements, tripods and monopods are usually impractical. I prefer to reduce motion blur by increasing the ISO and shutter speed settings. Framing your subject against an uncluttered neutral background and selecting an f-stop that reduces the depth of field so that the background is out of focus can produce crisper images. The equipment and methods described here are simply what seems to work for me and are by no means definitive. The glory of modern digital photography is that there is ample scope for experimentation. The results are instant and free. The images shown here were mostly taken in a patch of Ribbon Bush (Hypoestes aristata) over several days in April. This remarkable plant grows naturally in our eastern coastal region and is widely cultivated. 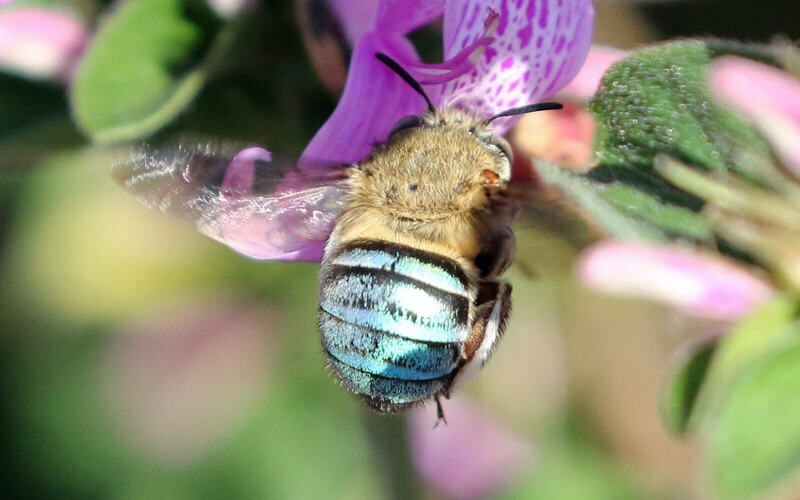 In contrast to some plants, which have evolved mutualistic relationships with specific pollinators Hypoestes makes use of a wide spectrum of potential pollinators. Its profuse showy flowers are testament to its “intent” to attract all manner of passers by. 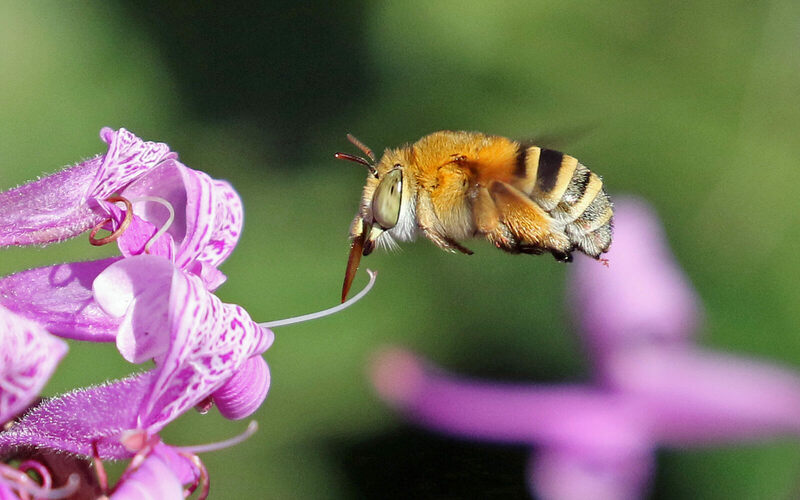 Honey Bee (Apis mellifera) extracting mauve pollen from Hypoestes. 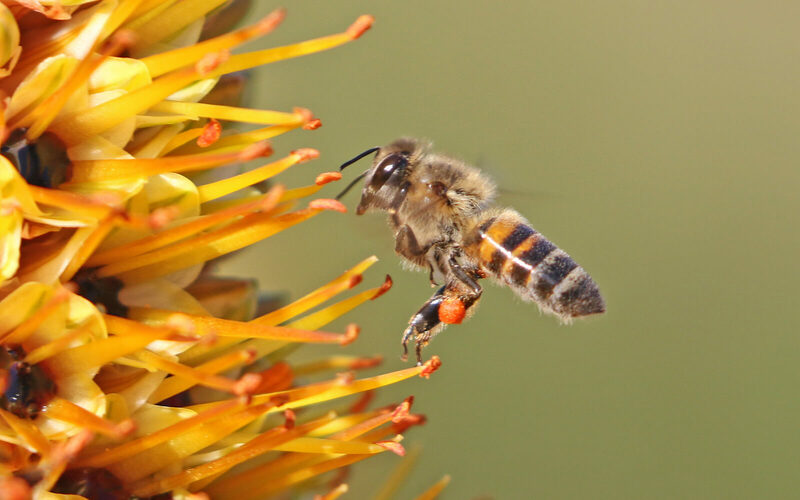 Honey Bee (Apis mellifera) homing in on an Aloe spicata. Note dark brown nectar oozing from the flowers and orange pollen gathered by the bee. 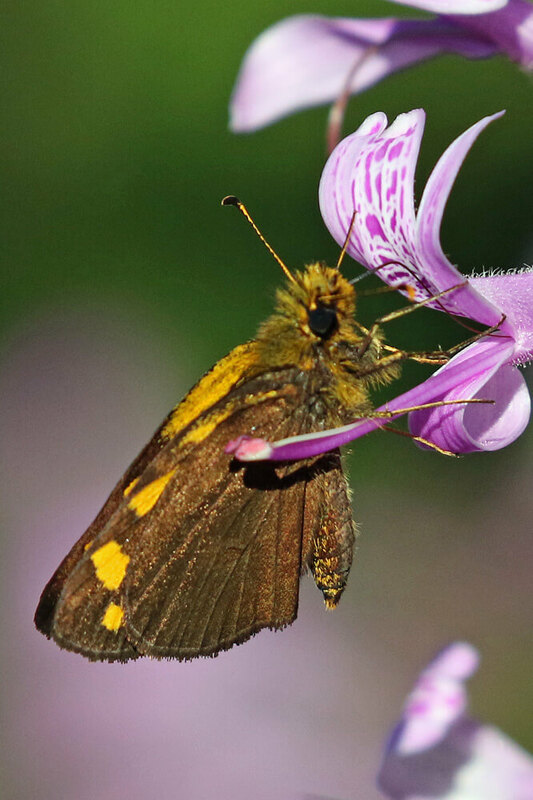 Coastal Purple Tip (Colotis erone) with its proboscis deep in a Hypoestes flower. 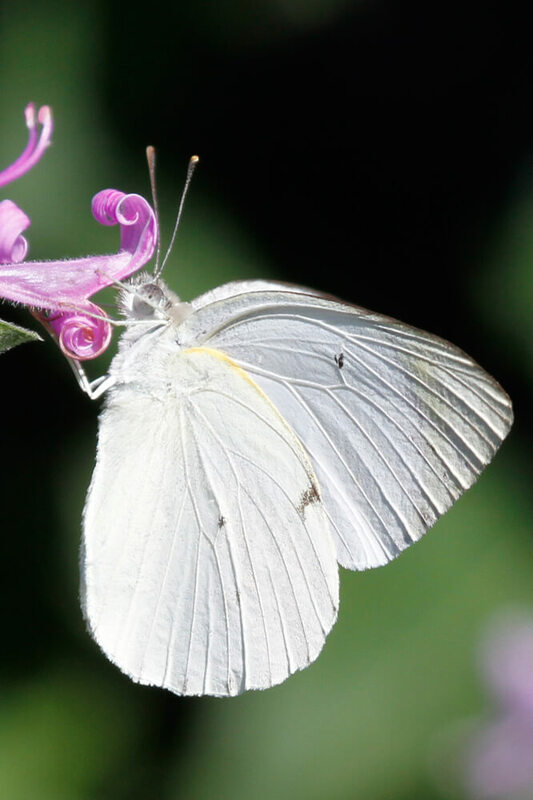 The purple tips are not visible as they are located on the inner forewings. Mocker Swallowtail (Papilio dardanus cenea) feeding on Hypoestes. Note excess length of the proboscis. Gold Spotted Sylph (Metisella metis) feeding on Hypoestes. 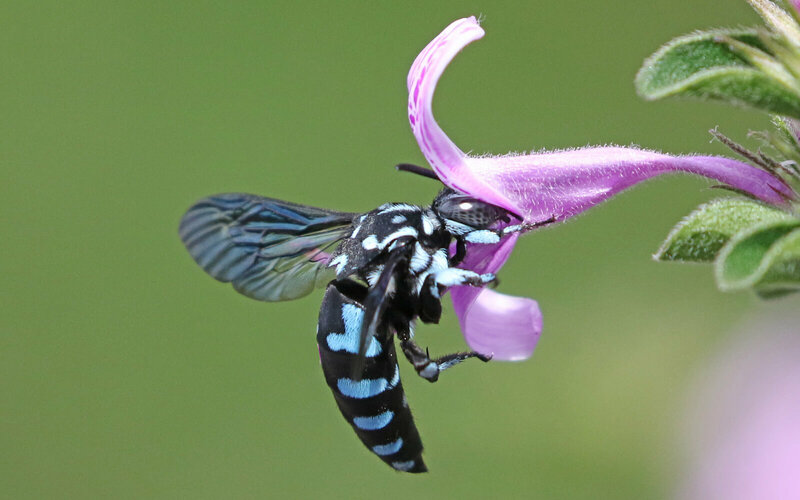 This cuckoo bee (most probably Thyreus), shown feeding on Hypoestes, is known to parasitise the nests of bees in the Genus Amegilla (see below). 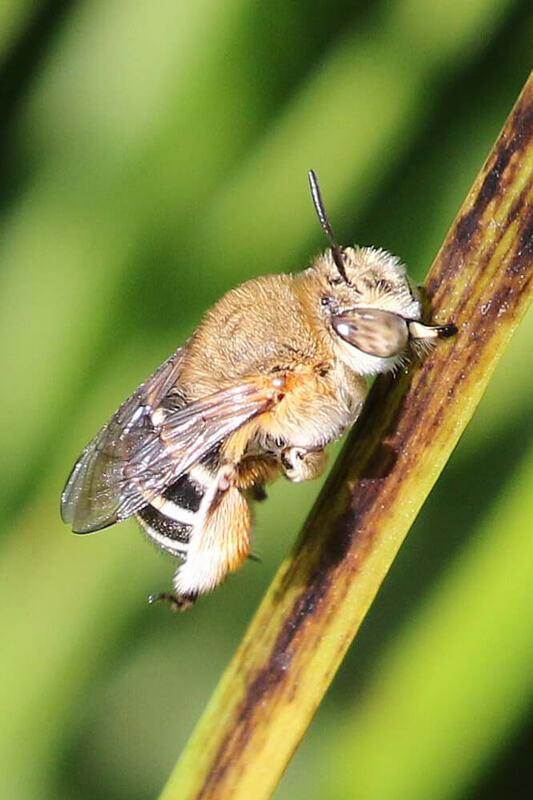 Amegilla caelestina was formerly allied with the Carpenter Bees (Anthophoridae) but has been re-assigned to the Honey Bee family (Apidae). 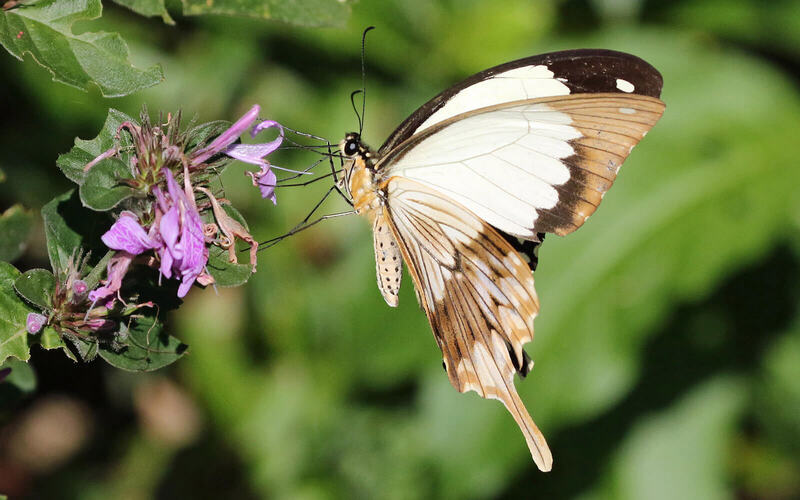 It is commonly seen collecting nectar from Plectranthus. Amegilla atrocincta (seen here on Hypoestes) is closely related to Amegilla caelestina and has a similar lifestyle. 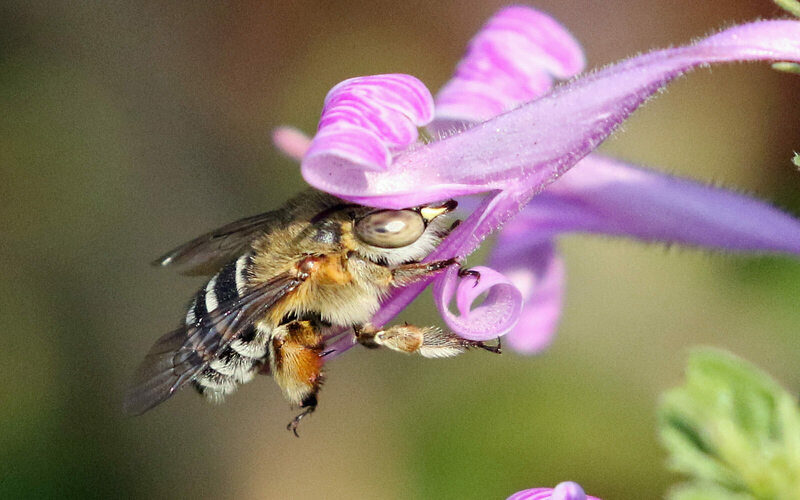 The relatively short proboscis of Amegilla atrocincta forces it to probe deeply into Hypoestes flowers. Amegilla atrocincta has a curious habit of sleeping (usually in groups) with their jaws embedded and locked onto grass stems. 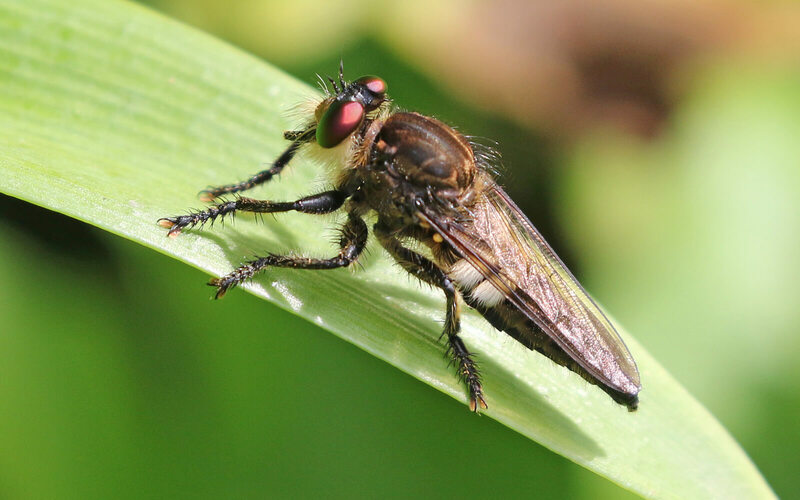 This Tangle-Veined Fly (species unknown) is a member of the Nemestrinidae family. They are noisy (buzzing) precision fliers with a long proboscis that is accurately inserted into flower tubes. Tangle-Veined Fly feeding on Hypoestes. Rapid wing motion has obliterated any evidence of wings in this image yet the body is clearly defined and appears static. This fly has precision hovering skills. 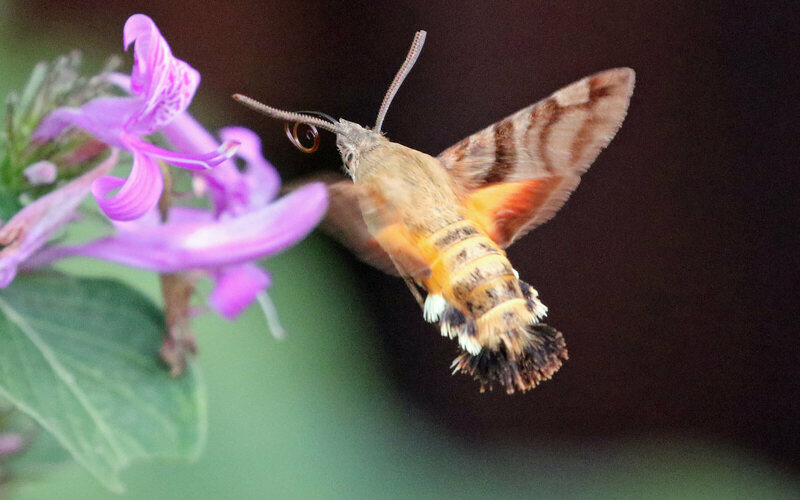 The common and scientific names of the African Hummingbird Moth (Macroglossum trochilus) reveal a lot about this nectar feeder. Its frenetic activity, rapid wing beat and darting flight patterns give a strong impression of a small humming bird. 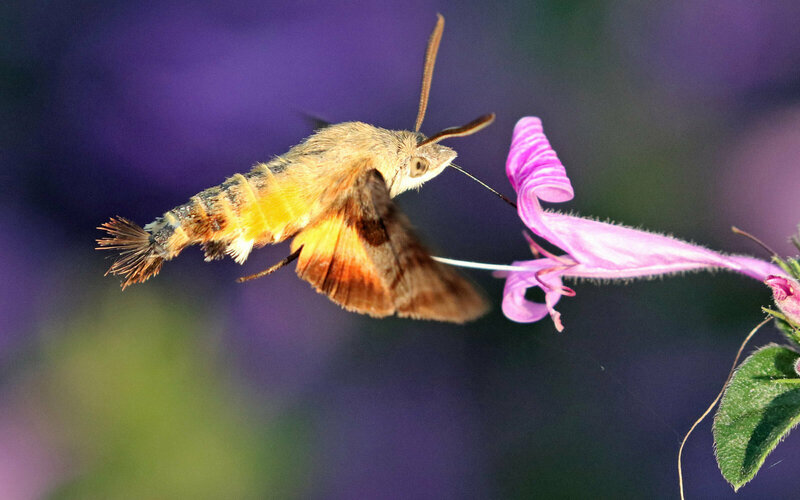 It has a very long coiled proboscis (macroglossum) that is used to probe for nectar. It inhabits a variety of veld types over much of Africa and is common in gardens. The wing beat of a closely related species in the Northern Hemisphere is reported to be around 80 per second (faster than a humming bird). 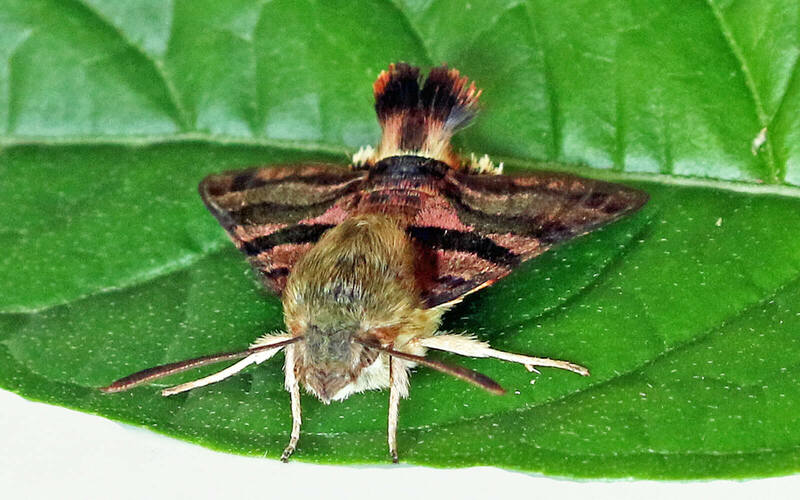 The African Humming Bird Moth is classified as a Hawk Moth (Family Sphingidae). On the rare occasions that it can be observed at rest, their streamlined triangular shape, often characteristic of Hawk Moths, is revealed. 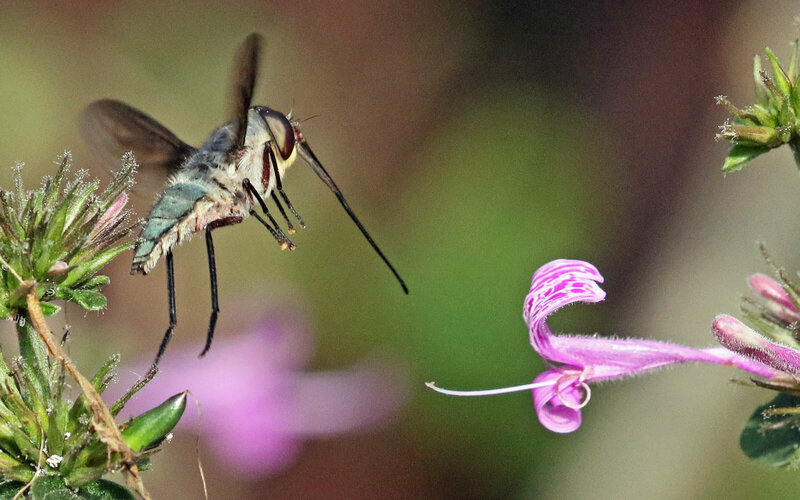 This Humming Bird Moth is approaching a Hypoestes flower with its proboscis coiled. The long proboscis of the Humming Bird Moth provides for a degree of flexibility in penetrating flower tubes of varying length. In any situation where there are a variety of species actively feeding on nectar it is probable that there will be ambush predators in waiting. They would typically have no interest in nectar and be simply focused on securing an opportunistic protein meal. This Assassin Bug (Genus Phonoctonus), which usually preys on “Cotton Stainer” Bugs (Genus Dysdercus) shows some battle scars. 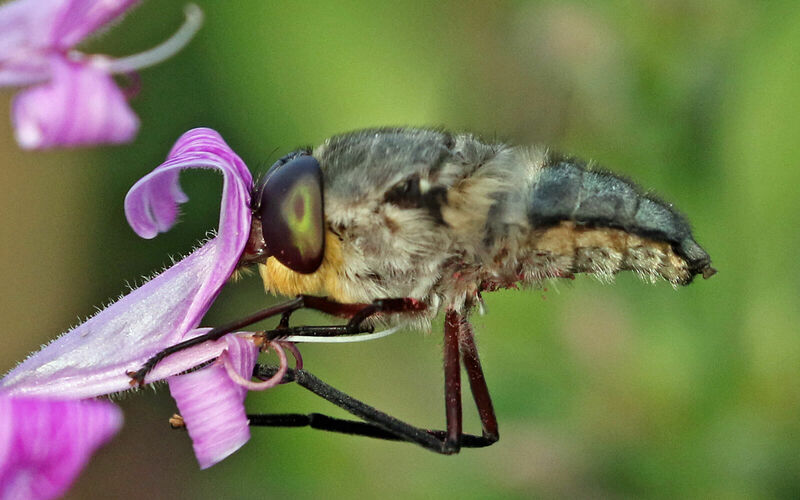 A Robber Fly (species unknown) lies in wait to ambush an insect. They are voracious predators and will capture their prey in flight. 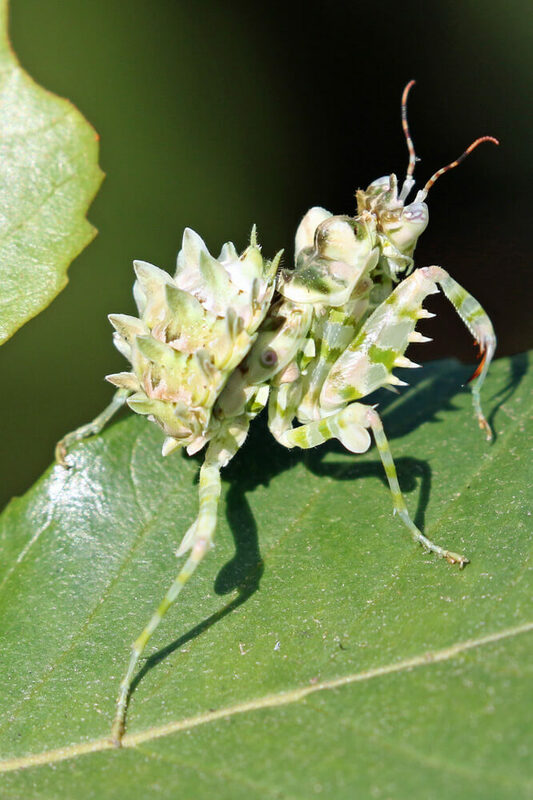 This Eyed-flower Mantid (Pseudocreobotra wahlbergi) is a relatively subtle predator and relies on stealth and camouflage to secure its prey. I hope that this small collection of somewhat random images has served to reveal the fascinating relationships that exist between plants and insects as they go about the critical task of pollination. High speed digital photography seems set to play an increasingly important role in probing the finer details. Picker M, C Griffiths and A Weaving (2002). Field Guide to Insects of South Africa. Struik. Woodhall S (2005). Field Guide to Butterflies of South Africa. Struik. 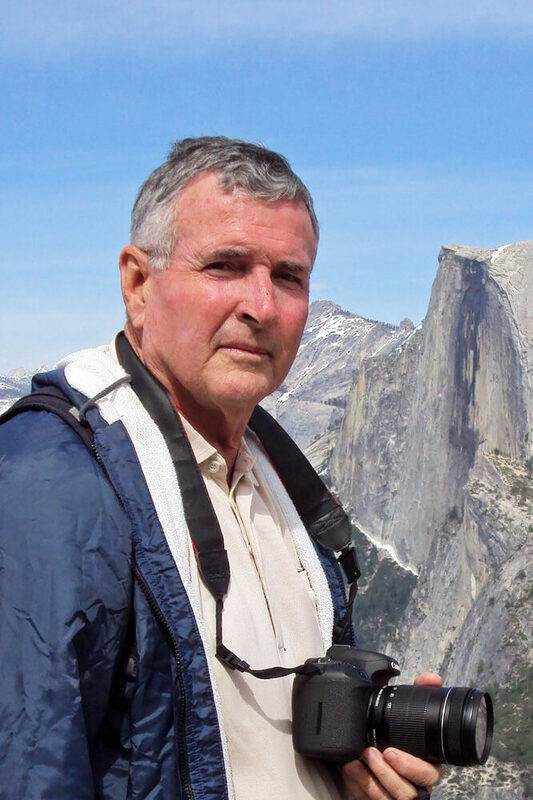 Tim McClurg is a semi-retired marine biologist. He lives on the edge of Krantzkloof Nature Reserve and is a long-term member of Kloof Conservancy. He is an avid wildlife photographer.